Since taking over as the head of the Environmental Protection Agency, Scott Pruitt, a longtime critic of the very agency he now oversees, has moved to undo, delay or block over 30 environmental regulations. That's more rollbacks than any other administrator in the agency's 47-year history over such a short period of time, according to the New York Times. What are the bills President Trump has signed? Since his February confirmation, Pruitt has embarked on record-setting rollbacks, including filing a proposal to undo Obama-era climate change regulations, legal plans to repeal pollution in the nation's waterways, delaying rules requiring fossil fuel companies to rein in leaks of methane and greenhouse gases, and reversed a ban on the use of a pesticide the EPA deemed dangerous to children's health. "Just the number of environmental rollbacks in this time frame is astounding," Richard Lazarus, a professor of environmental law at Harvard, told the Times. "Pruitt has come in with a real mission. He is much more organized, much more focused than the other cabinet-level officials, who have not really taken charge of their agencies. It's very striking how much they've done." 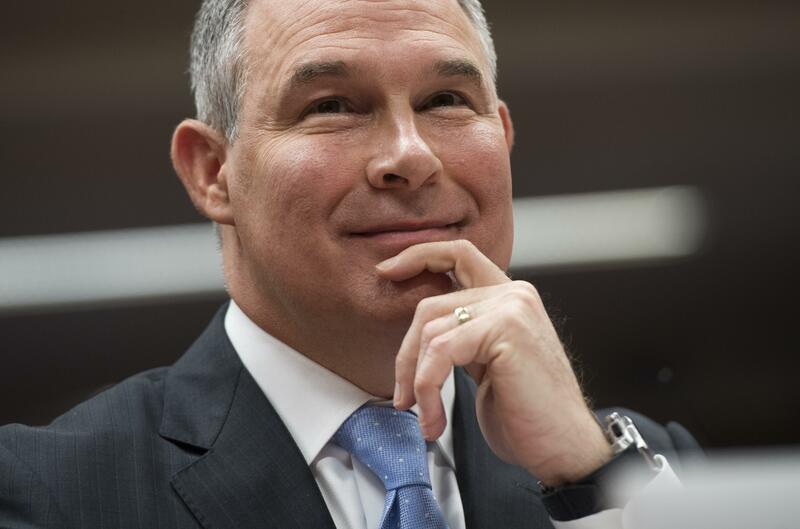 Environmental advocates say Pruitt is weakening or doing away with numerous necessary regulations, and point to his habit of hiring deputies from major corporations and lobbying groups. Pruitt has also met with numerous corporate lobbyists as he puts his agenda into action. "It amounts to a corporate takeover of the agency, in its decision- and policy-making functions," Robert Weissman, the president of Public Citizen, told the paper. Perhaps the most notable and controversial of the Trump administration's rollback of environmental regulations is Mr. Trump's formal withdrawal from the Paris Climate Agreement. Pruitt will now take a leading role in steering the withdrawal, according to the Times. The pact is aimed at combating climate change around the world and helping nations adapt to its effects by requiring countries to present plans to reduce carbon emissions. Specifically, it requires countries to set their own targets for reducing emissions by 2020. Climate change and the administration's climate accord pullout are expected to become a major topic up for discussion as Mr. Trump heads to Hamburg later this week to meet with other world leaders at the G20 summit. Pruitt, meanwhile, says his agency will continue to prioritize handling what he calls "tangible" pollution, such as cleaning up Superfund sites.